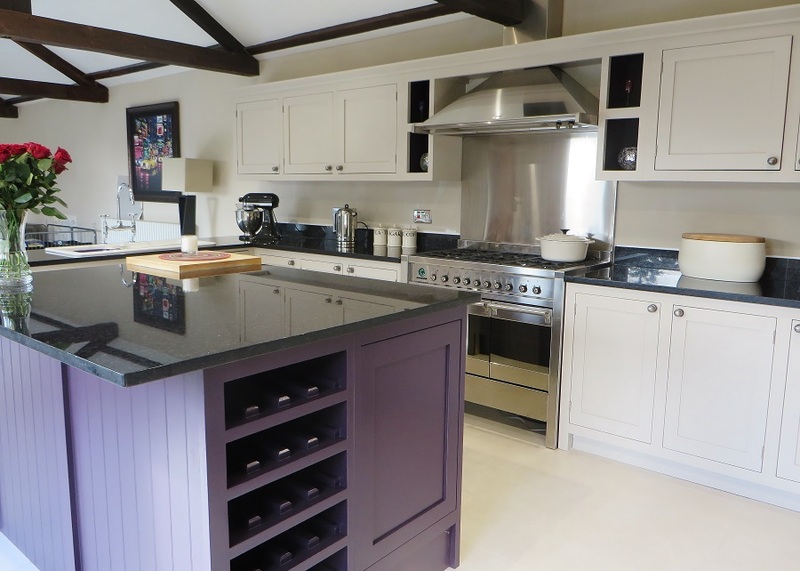 This is a recent Hand Painted Kitchen project I undertook in a beautiful home near Wetherby in Yorkshire.The house was a barn conversion with stunning oversized windows running almost the entire length of the house. 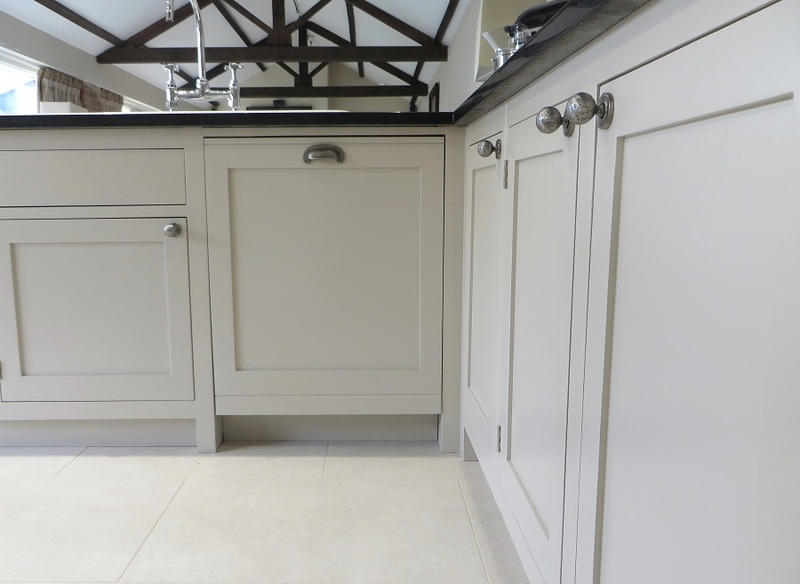 The client had always wanted a hand painted kitchen and had been waiting years for the oppertunity. With this kitchen she had it. 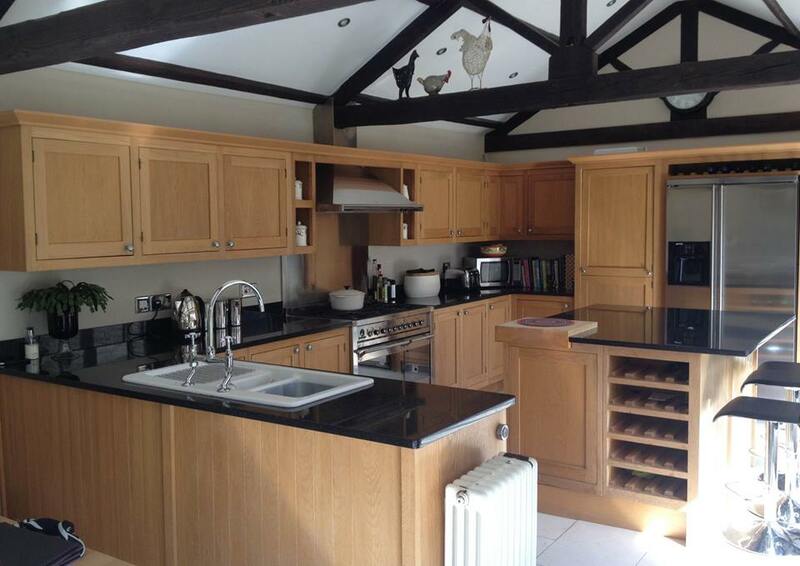 Extremely well made and solid oak, the kitchen and layout worked really well but unfortunately it was now looking tired, dated and the wood was turning orange. It would be very costly to replace it for something of the same quality – time for a painty transformation! The kitchen itself has masses of natural light, (the main wall to the right is almost completely glass), so the units could definately take a ‘mid tone’ without looking too dark. The client also really wanted a contrasting colour for the island. We looked at various colour swatches and settled on The Little Greene Company’s ‘Rolling Fog’ for the main units and Farrow & Ball’s ‘Pelt’ for the island. 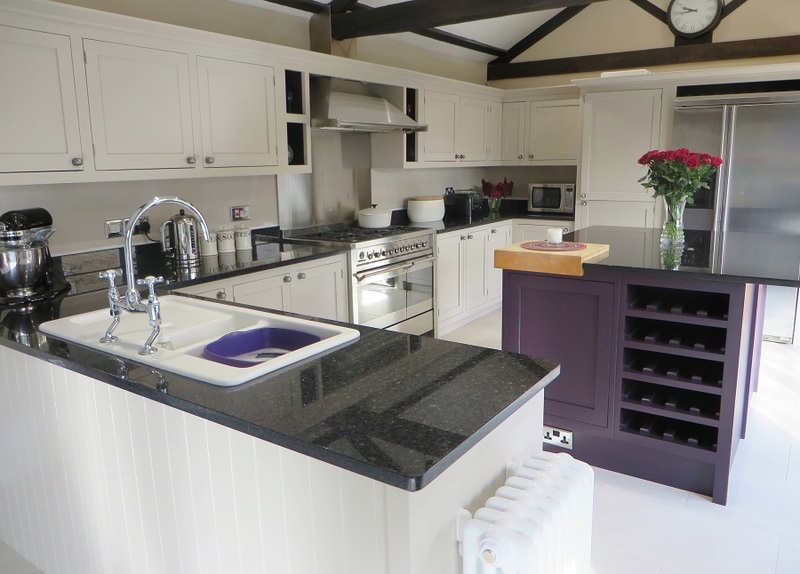 The client’s favourite colour is purple so ‘Pelt’ was perfect – deep purple and definately a contrast! ‘Rolling Fog’ may have looked too dark in some kitchens but worked wonderfully here with the high levels of natural and artifical light. 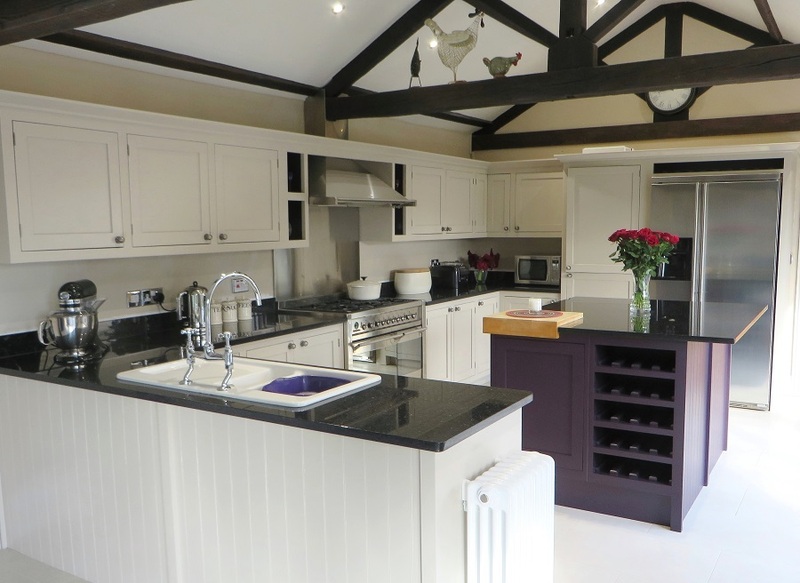 Each kitchen is different, with different lighting, floors, worktops etc so what colour works for one, may not work in another. We did have a look at some lighter ‘off whites’ but they all looked too stark and in some cases, almost white. It was also important that the colours chosen had warmth but weren’t yellowy or too pinky as this wouldn’t have complemeted the exisitng decor. ‘Rolling Fog’ was ideal as it only had a touch of pink for warmth but also hints of grey and brown that complimented the carpet, floor and curtains. The couple were so happy with the consultation they gave me a deposit cheque there and then, happy to wait a good few months for the right man with the right approach. Before I arrived certain things had been altered, chief amoung which was the laying of new floor tiles (the originals were cracked and damaged in places) and the fitting of new hinges. In order for the floor to be re-tiled the whole kitchen had to be removed as the old tiles had been layed under the units. For this side of the project I had put the clients in touch with my joiner/handyman collegue, Colin Foggin. As usual he did a great job, taking the kitchen out and re-fitting it. He also replaced the hinges and made sure all the doors and drawers fitted perfectly before the prepartion and painting began. Without the right preparation, the adhesion, durability and overall quality of the finish just won’t be there. On any kitchen job around 60-70% of the work is in the prep. 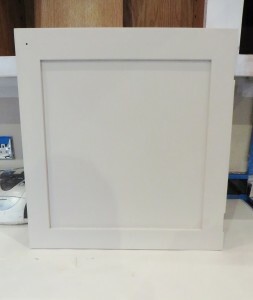 If this is done well with a high attention to detail, then not only will the finish be silky smooth, but it will be super durable and last for many many years. 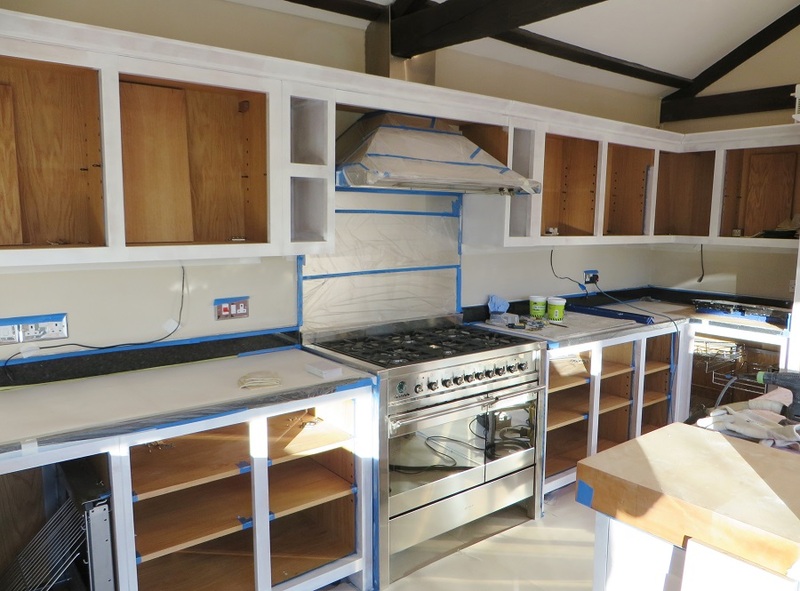 With this particular kitchen I decided the best route would be to remove all the doors and drawers and prepare and paint them seperately to the shell. 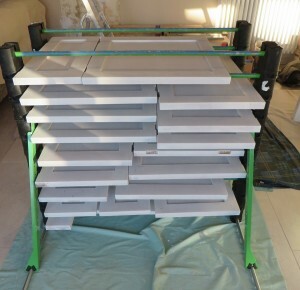 To make this as easy and efficient as possible I used my * Erecta Rack. The beauty of the * Erecta Rack, is that it is not only lightweight and easy to set up but also incredibly flexible in its usage. For some jobs I use all 10 levels, for some only one or two. 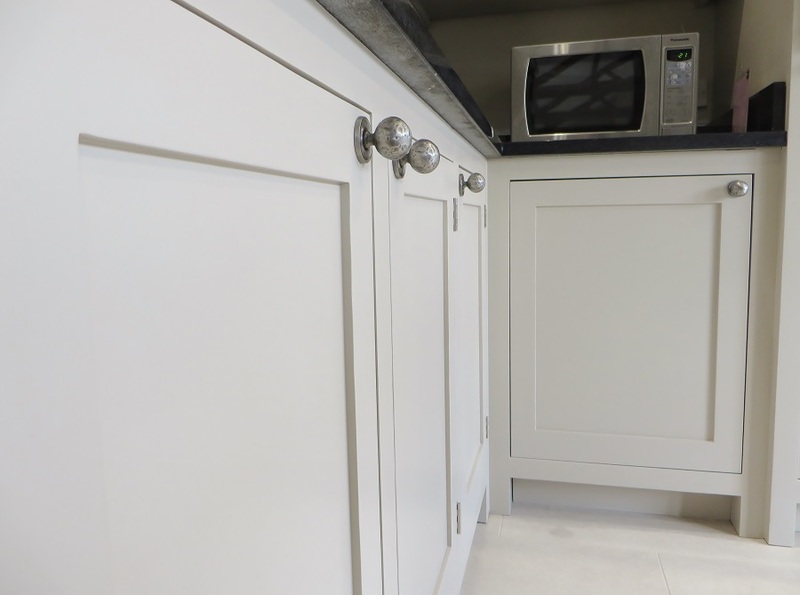 As with all my kitchen projects, the first thing I did was to remove all the handles and then thoroughly clean and degrease all the doors and drawers with * Krudcutter Original, a fabulous eco-friendly product that, for me, has made sugar soap obsolete. 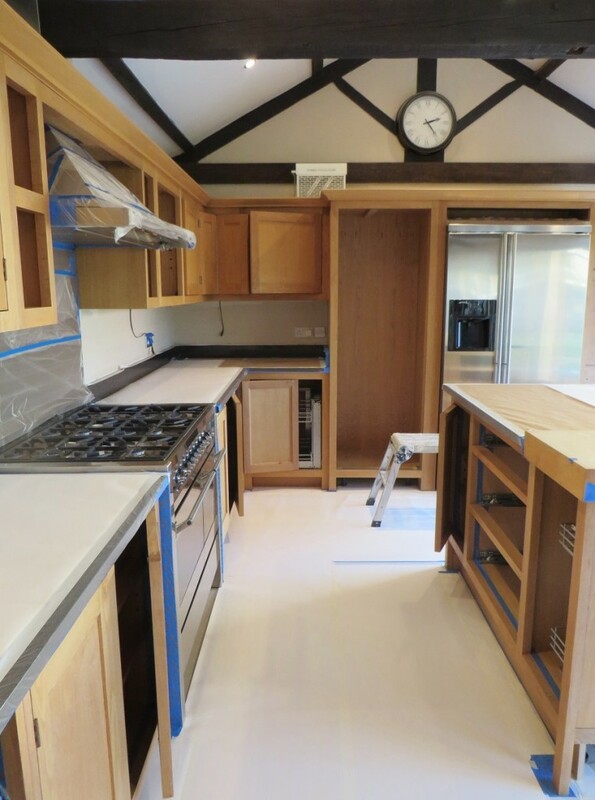 Once cleaned and wiped down with a damp cloth, I then masked off the floors, worktops, walls and other areas with 1200 lining paper and various tapes. Different masking tapes have different properties and I typically use 3-4 different types when masking off the different areas of a kitchen. Some masking tapes can bleach wood over time and some cannot be left down for more than a day or two so it pays to know which one to use and where . Once cleaned and masked off the next stage is one of the most important ones – the sanding. Every sqaure inch of any kitchen should be thoroughly sanded so a suitable key is achieved and the paint can adhere properly. If any corners are cut with the cleaning or sanding stages then there can be adhesion issues and in time the paint will start to chip or peel. It takes time to do the job properly but in my mind it is time well spent, I have never had a problem! Once sanded, and with any dust remnants removed, it was time to get the brush and roller out and apply the first coat of primer. 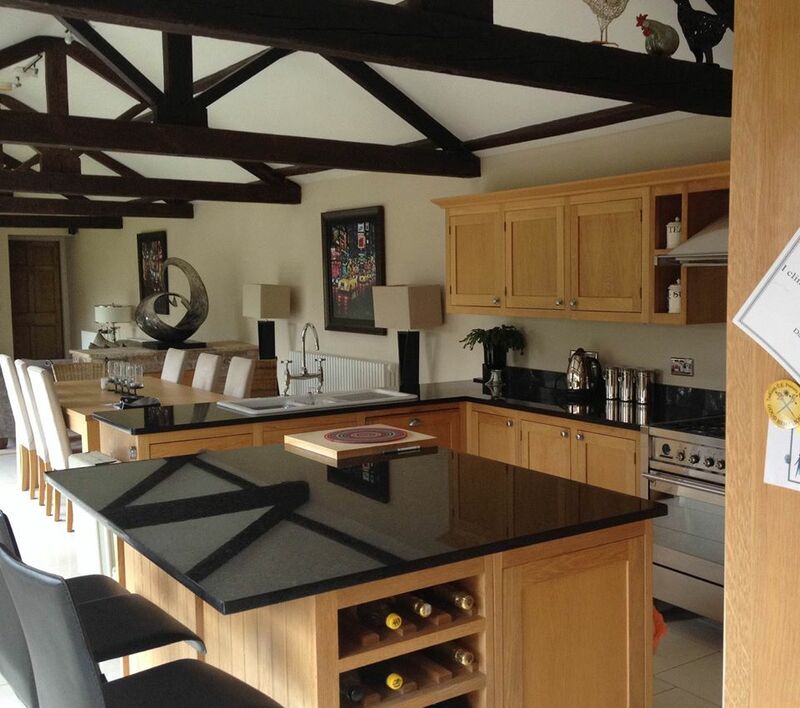 As this kitchen was oak I first applied Zinsser Bin, a high adhesion shellac primer that is great for three main reasons – it resolves the potential problem of the oak ‘tannin’, it has great opacity and it is dry within a hour. I then sanded everything back again to create a perfectly smooth base, hoovered up any dust again and filled/caulked any areas that needed attention. The next stage was to apply another coat of high adhesion primer, this time Otex by Tikkurilla. This is another fabulous primer which can be tinted to the same colour as the top coat to ensure maximum coverage and depth of colour. This, along with my ‘Empire‘ top coats were tinted expertly to the equivalent shades of ‘Rolling Fog’ and ‘Pelt’ by Holman Paints. I prefer using these paints as they are tried and tested, renowned for their finish, their accuracy of colour, their durability and longevity. Tikkurila is not a company whose products are widely known in this country, but trust me they are the business when it comes to hand painted kitchen and furniture paint. The Otex primer was applied using a Fox Flock Roller Sleeve and ‘layed off’ using a Teklon bristled brush. Your top coat is only as good as the base, so the idea of slapping on primer any old how is not good painting practice at all. Getting nice smooth and even primer coats is pivotal to the overall finish and should not be rushed. 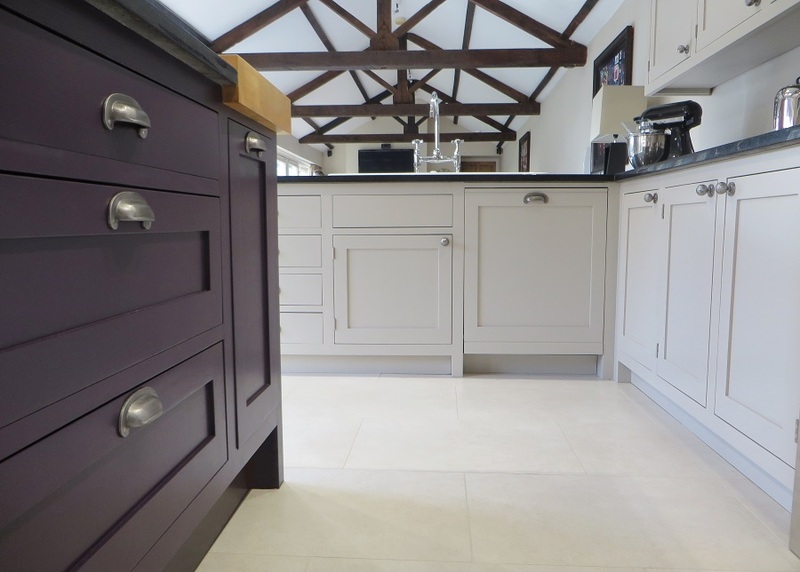 As I mentioned above the top coat I used was Empire by Tikkurila, which I had tinted to the equivalent of LG’s ‘Rolling Fog’ for the main units and F&B’s Pelt for the island. 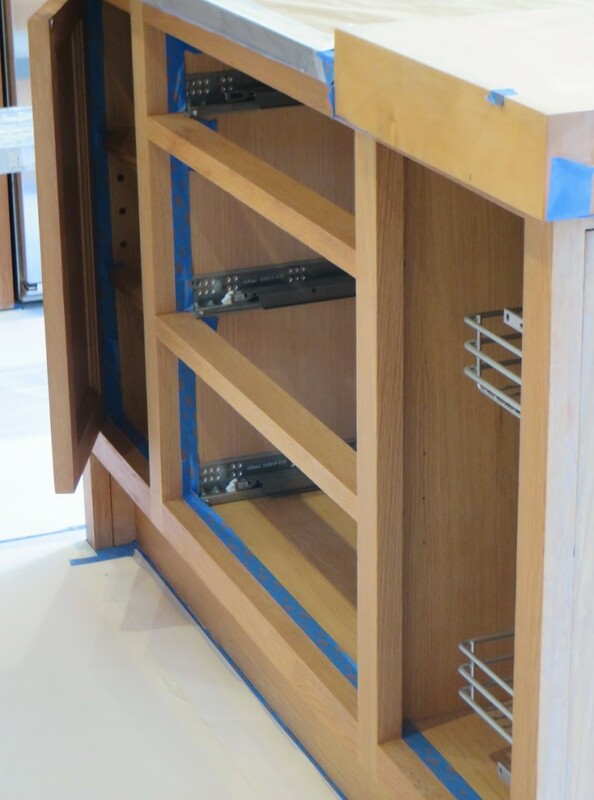 I applied 2-3 coats of this lovely soft sheen oil paint to the main units and 3-4 to the island. The island needing more coats in this instance due to the nature of the dark colour, the high level of pigment and the paints’ more transparent base. I used the same roller, brush and ‘laying off’ process for the top coats that I used for applying the primer. 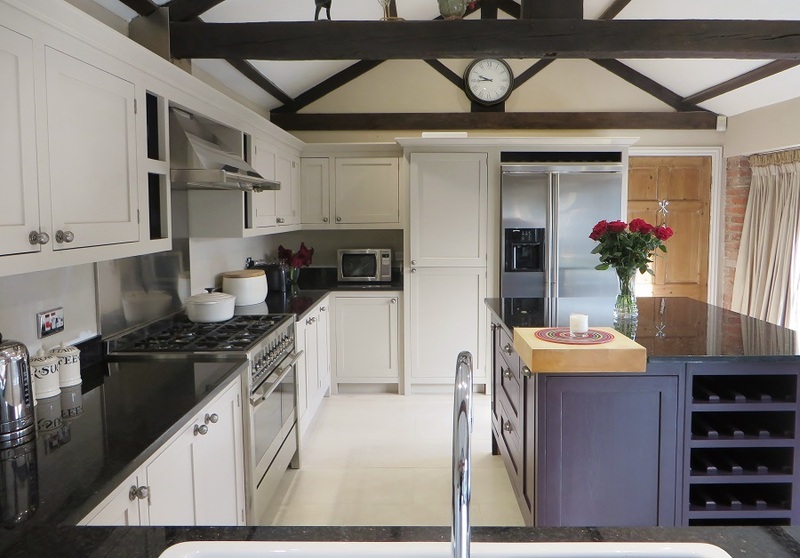 With some serious prep, lots of patience, years of experience and oodles of attention to detail the kitchen transformation was complete! Not only is it lovely to look at with no bits in the paint, no runs and no brush marks but it’s highly durable and ready for the rigors of day to day life. Deep Purple and quite a statement!